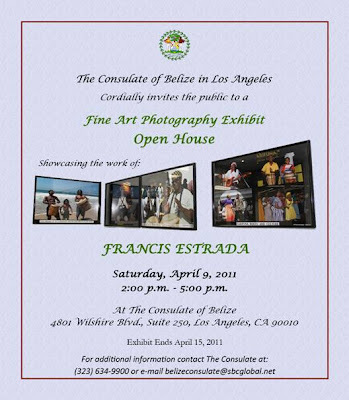 The Office of the Consulate of Belize will host an Open House on Saturday, April 9, 2011 for those wanting to view the photography display of artist Francis Estrada. As we stated in our January 24 press release, the Consulate would attempt to provide viewing of the photography display outside of our working hours. While we are not promising you a "rose garden," we can assure you that refreshments will be served to those in attendance. In addition, you will enjoy and appreciate artist Estrada's display.